Cowslip plant, Primula veris, is an attractive English wildflower. A tea from the whole plant, but particularly the flowers, are sedative and pain relieving. Flowers have been made into wine. 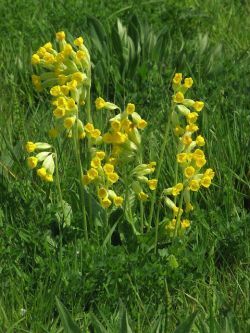 Cowslip plant is native to Europe and prefers heavy well-drained soils in a protected, partially shaded position. Frost resistant but drought tender. A perennial plant growing to 0.3m x 0.25m. Produces fragrant bright yellow flowers in spring. Be the first to review “Cowslip, plant” Click here to cancel reply.